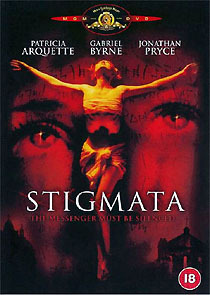 Stigmata recounts the story of a young hairdresser (Arquette), who displays the signs of a stigmatic, and a roguish priest (Byrne, counterbalancing his role in End of Days). The film is undeniably shallow, but Wainwright’s dynamic MTV-style approach and compelling performances from his two leads mean that the film doesn’t outlast its meagre premise. The disc contains a 16:9-enhanced 2.35:1 letterboxed presentation of the film. The film utilized a bleach-bypass process (popularised by David Fincher’s influential Se7en), resulting in a rather coarse look, with occasional intensified splashes of colours. The UK disc contains English subtitles, which aren’t available on the US disc. Ally McBeal star Portia de Rossi has an insignificant cameo role as one of Arquette’s colleagues. 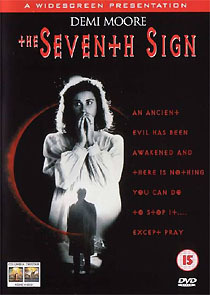 Contrary to the sleeve notation, The Seventh Sign is thankfully presented in its correct 2.35:1 ratio, enhanced for 16:9 TVs, in a very clean new transfer that’s a huge improvement on the cramped pan-and-scanned version used for the film’s VHS release. Aside from this there’s nothing very special about Columbia Tristar’s Region 2 disc, which offers skimpy biographical details for Schultz, Moore and Biehn and trailers for another two Demi Moore movies (About Last Night… and Mortal Thoughts) as the only extras.